International Dance Festival@Silicon Valley: The Artist/Teachers! 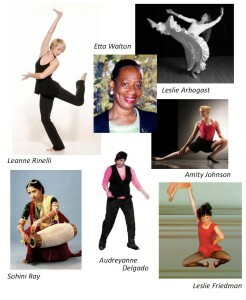 Here they are: dance artists who will open your dancer heart and help you to reach the heights of your dancing! Leslie Arbogast, Leanne Rinelli, Leslie Friedman will lead the M2F (Monday to Friday!) classes in Dunham technique, Salsa, and Contemporary tech and composition. On The Full Day of Dance© they are joined by Sohini Ray, teaching Manipuri classical Indian Dance, Etta Walton teaching Etta’s Electric Lines, Audreyanne Delgado-Covarrubias teaching tap, Amity Johnson teaching Pilates mat. Give yourself a chance to dance! August 11-17. It’s here before you know it; register now to get your Early Bird Discounts. Apply now for scholarship aide. Scroll down a couple of entries to get links for the forms. Then: come on and DANCE! This entry was posted in INTERNATIONAL DANCE FESTIVAL-SILICON VALLEY and tagged Amity Johnson, Audreyanne Delgado-Covarrubias, choreography, Contemporary Dance, Dunham dance, Etta Walton, International Dance Festival-Silicon Valley, Leanne Rinelli, Leslie Arbogast, Leslie Friedman, Maniipuri dance, Pilates mat, salsa, Sohini Ray, Summer Dance Festival, Tap Dance on March 25, 2014 by Leslie. This entry was posted in INTERNATIONAL DANCE FESTIVAL-SILICON VALLEY and tagged International Dance Festival-Silicon Valley, Leslie Friedman, Mountain View CA, Mountain View Masonic Center, performance opportunities, Summer Dance Festival on March 21, 2014 by Leslie.